Cornerstones provides answers for individuals and families who are in crisis, connecting them to resources and support that offer them a measure of control when it is needed most. The Embry Rucker Community Shelter (ERCS) welcomes those who find themselves without a roof over their heads and needing assistance to obtain housing stability. In FY18, 449 individuals, comprising 62 families with 114 children, were provided shelter at ERCS. An additional 395 individuals participated in the winter hypothermia program, or a Medical Respite program that enabled extremely ill people, who would have been discharged from hospital to the streets, to be able to recover in a safe, stable environment. Cornerstones’ outreach team works to engage those who are chronically homeless in the community and resist efforts to secure shelter or housing. and families when they use their food stamps or “SNAP” cards to shop for fresh and healthy produce, organic fish and meats at the Reston Farmers Market. This “SNAP at Market” program was the most successful in the County in FY18, giving clients access to improved nutrition and thus health, while supporting the local business community through sales of more than $20,000 last year. In FY18, ASAPP served 5,320 individuals (including 2,179 families and 3,123 children) with bags of groceries, diapers/wipes, clothing vouchers, and rent and utility assistance. In addition, with support from generous neighbors in the community, it distributed over 5,000 seasonal gifts, from back-to-school packs to Thanksgiving baskets and holiday gifts. 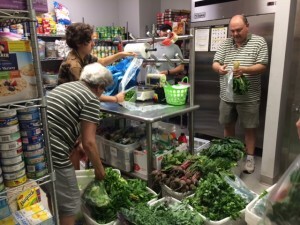 Cornerstones' "SNAP at Market" -- The Most Successful in the County! This year Cornerstones piloted a new initiative at Reston Farmers Market where SNAP (food stamps) could be used to purchase fresh produce. With partner support, every SNAP dollar used at the market was matched up to $10 to encourage healthy food choices.